Born and raised in Los Angeles, California, Jennifer Amiel is the author of middle grade adventure novel Chloe Diggins and The Eternal Emperor. Jennifer has a degree in Anthropology with an emphasis in Archaeology and a Master of Arts in Museum Studies. She draws on experience for Chloe Diggins from work on archaeological dig sites on the Santa Barbara coast, on the California Channel Islands, and in the Middle East. The character of Chloe Diggins was born out of Jennifer's desire to create a female character who is strong-minded, smart, a little daring, and not afraid to get some dirt under her nails! Jennifer has a passion for learning about new people and places and has traveled to South America, Central America, Europe, North Africa, and the Middle East. She resides in Pleasanton, a small city in the San Francisco Bay Area, with her husband and two children and works as Director of Education for a museum. Thank you for visiting the website for Chloe Diggins and The Eternal Emperor. I hope you enjoy joining Chloe on her adventures. Please let me know how you liked the book, ask any questions, and tell me where you would like to see Chloe's adventures take her next! Q: What inspired you to write Chloe Diggins and The Eternal Emperor? A: A few things... I’ve always loved a great adventure story. Archaeology continues to be a popular theme for adventure books and films, but in most of these stories almost no time is spent on excavation sites. I wanted to write a story that is exciting and intriguing but also reveals the real world of archaeology to kids. I wanted to give readers a glimpse of work on a dig site, send the characters on a fast-paced adventure, and inject a little history along the way. I was also inspired by my desire to create a heroine who is a role model for kids. As a mother of two children, I wanted to create a story that would demonstrate the potential of a young girl who is smart, warm, and adventurous! The book portrays characters I would want my children to emulate in the real world: kids who work hard, are kind to others, and value others for who they are inside. Q: Is Chloe Diggins based on a real person? A: Chloe Diggins is not based on one particular person, but on a number of women I admire. I want Chloe to be a role model for girls and believe it is important for girls to see themselves in the role as adventurer or explorer. We must continually remind girls they should go after the careers that excite them. They can and should dream of being an archaeologist or a mathematician or a doctor or a teacher or a scientist… The book’s heroine is modeled partly on a few of my female professors in university. They always struck me as women who could take on the world. They were women in a field largely dominated by men and succeeded without apology. Chloe also has the friendliness and grace of my mother, the kindness of my sister, and a whole lot of my curiosity and need to push boundaries. After writing her character, I feel like Chloe is a great friend of mine. She is smart, confident, warm, and someone I would want my daughter to be friends with. 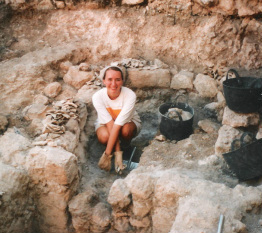 Q: Did you always want to study archaeology? A: Studying archaeology excited me more than anything else. As a young girl I was always drawn to history and antiquities. I collected antique books and looked forward to getting my National Geographic and Archaeology Magazine in the mail. I think an appreciation for the artifacts of human history is what moved me into archaeology and eventually into museum work. I’ve always felt that objects have a life to them and the older the artifact the more intriguing the story. With an artifact you have to wonder about the person who made it, the person who owned it, and maybe even the person who left it behind. It’s wonderful to be able to bring an artifact to life for someone. I love putting a potshard into a child’s hand and seeing their awestruck face when I tell them it was crafted by someone over 1,000 years ago. It’s such a special experience, a connection with an artifact and its path through the world. Q: What is the best part of working on an excavation? A: You never quite know what a day on an excavation will hold. You can work all day in 100 degree heat, move buckets until you can’t feel your arms, and go home covered in dirt having found nothing of significance. But other days can be quite the opposite. Considering how tedious fieldwork can be, the moments of discovery make it all worth it. I think my most wonderful find was actually something quite small. While cleaning beside a large column at a Byzantine pilgrimage site in the Middle East, I noticed a small blue object as it fell into the dirt at the bottom of the trench. After cleaning it off we came to discover it was a piece of a glass bracelet worn by a woman over one thousand years ago. I wondered what her life was like and what kind of person she was. I wondered if she could have ever imagined another woman so many years later would admire her piece of broken jewelry. Q: Will Chloe go on more adventures? A: Chloe’s story is definitely not over. We know from the end of Chloe Diggins and The Eternal Emperor that she’ll be heading to Ireland next. I will begin work on that book soon. She has the potential to go anywhere in the world and I’m looking forward to feedback from readers to help guide Chloe on her adventures to come. I hope readers will continue on this journey with Chloe… I think it’s going to take her to some amazing places!